Canadian sextet The Most Serene Republic have the honor of being the first band to sign to Arts & Craft that doesn't feature a member of Broken Social Scene. 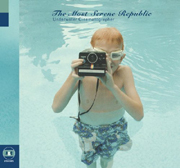 Still, The Most Serene Republic does tip their hat to Broken Social Scene on their debut, Underwater Cinematographer, an eleven track collection of gorgeous melodies, indie rock experimentation, and layered instrumentation - again, much like Broken Social Scene. The "Prologue" is a textural sound bite that opens the album. Melding electro beats with shoegazer guitars and a delicate piano, the song sets the tone for the rest of the album. Including "The Protagonist Suddenly Realizes What He Must Do In The Middle Of Downtown Traffic", a song that wouldn't be out of place on Broken Social Scene's new record, what with its full-on rock that soon cuts away to nothing but piano before building into a rock explosion once again. Or the space-rock of "In Places, Empty Spaces". Then there is jazz-meets-folk sound of "King Of No One". The "Epilogue" ends the album with a mesh of sounds, including epic organ, jazz gone awry, and scenic indie-rock. An impressive debut from a band more than capable to match the critical acclaim and popularity of labelmates Broken Social Scene, I'll give it an A.